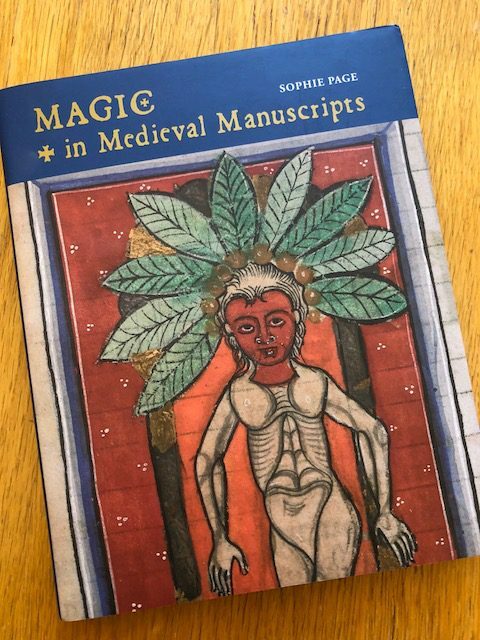 This delightful little pocket sized book by Sophie Page, published by the British Library, is lavishly illustrated by many mediæval manuscripts and explains the conundrum in the Middle Ages of angels and devils, magicians, magic spells and charms. The conundrum was that from the mid-thirteenth century there was a backlash against magic yet the church still wanted their followers to believe in the good and evil of angels and demons, but not of magicians and sorcerers. Despite the book’s small size there is a huge amount of information, presented in a very readable way. 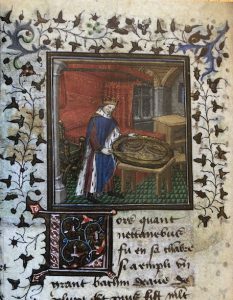 The five chapters of The Medieval Magician, Natural Magic, The Power of the Image, The Magical Universe, and Necromancy and Sorcery cover the topic comprehensively. 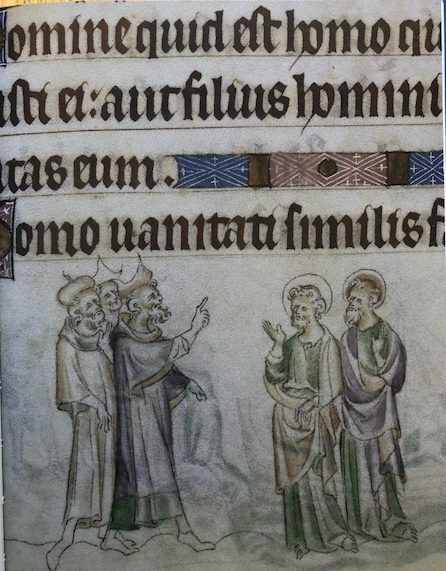 Magicians and saints possessed special powers but the latter were not always the victors. 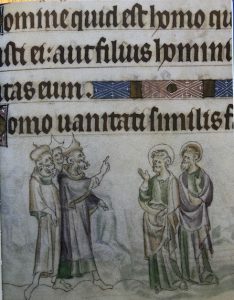 Here Saints Simon and Jude, who were murdered by the crowd after they drew forth demons from statues of pagan gods but refused to sacrifice to the sun, meet up with three magicians shown wearing exotic hats. 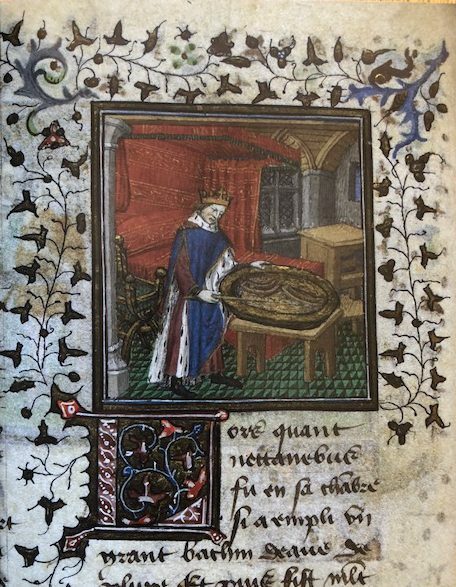 Alexander the Great’s father, the exiled Egyptian king Nectanebus, was a magician, and he used to sink ships by creating images of them and pushing them under the surface of water in a basin, as shown here. 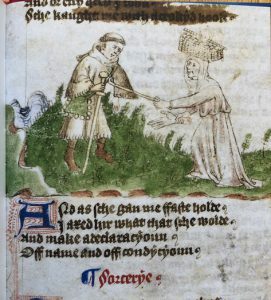 And he appeared to influence the English court in 1376, when Edward III’s mistress, Alice Perrers was said to have acquired her powers over the king due to a Dominican friar who used spells from ‘the Egyptian necromancer’ Nectanebus. 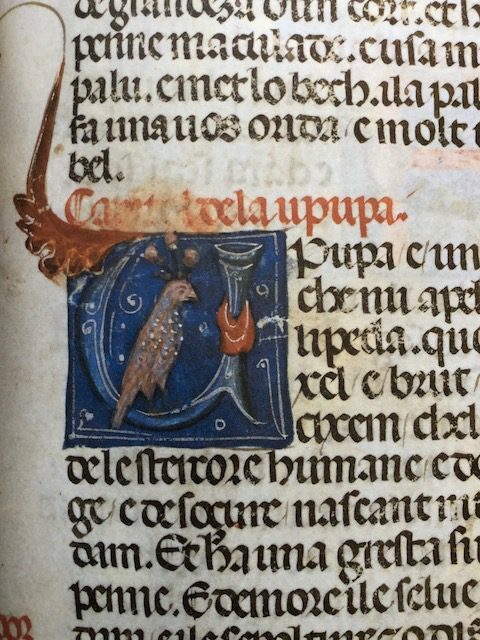 Animals and plants were also believed to have magical powers, or at least powers that couldn’t be easily explained. A mandrake plant killed the person who pulled it up, but a dog pulling out the plant would take the curse. The mandrake was valued because it was believed to cure epilepsy, snake bites, gout, baldness and afflictions of the eyes and ears. The blood, feathers and heart of the exotic hoopoe, shown here, was used in necromantic rituals, and the heart, marinated in honey and put under the tongue would then ensure that that person could understand the language of birds. Sorcery was often personified by an old woman. Here she has a severed hand and uses her stick to poke at a pilgrim. In her baskets she has ‘Many knyves and hoodys ek,/ Dyvers wrytes and ymages, / Oynementys and herbages’. The cut off hand indicates that she can tell fortunes from palms. 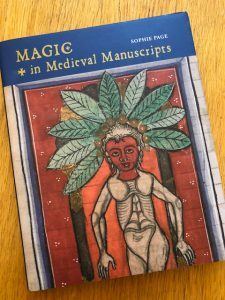 This is an interesting and informative book and is ideal for those who loved images from mediæval manuscripts, learning more about what they represent and finding out about the fascinating spells, potions, magic and beliefs of the period. This is highly recommended. 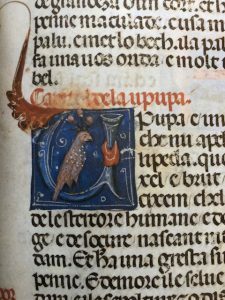 This entry was posted in Blog, Manuscripts and tagged British Library, Magic, Magic in Medieval Manuscripts, manuscripts, mediaeval, Medieval, medieval manuscripts, Sophie Page on 15 July 2018 by Patricia.